Babblings of a Mommy: Rio DVD Giveaway!! --CLOSED. 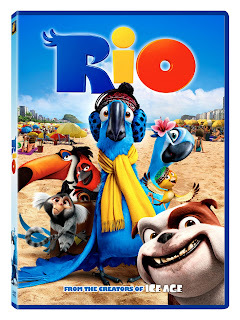 Rio tells the story of Blu (Jesse Eisenberg), a Spix Macaw who is captured from his native homelands of Brazil at a young age to be domesticated thousand of miles away with his human owner Linda. His new owner soon discovers that he is the last male of his kind, and with that , the two head south to Rio de Janeiro to meet Blu's new mate. 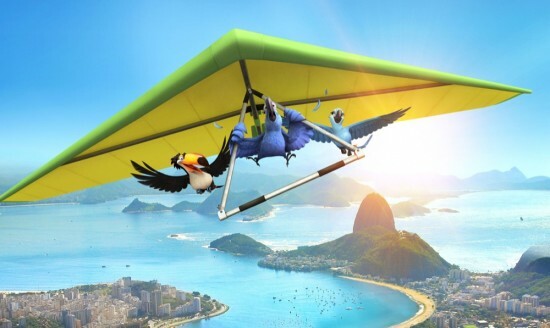 However, it is nowhere near close to love at first sight between the socially awkward, flight challenged Blu and the strong and independent extreme flying female Jewel (Anne Hathaway). Shortly after Blu's arrival, greedy animal smugglers capture the two rare birds and they soon find themselves helplessly lost in the Brazilian rainforest. Unexpectedly thrown together they embark on a hysterical and endearing adventure where they learn about friendship, love, courage and spreading ones wings to fly. The creators of ICE AGE bring audiences a whole new tropical adventure in RIO featuring the most colorful cast of characters south of the Equator, including George Lopez (Beverly Hills Chihuahua), Tracy Morgan ("30 Rock"), Jemaine Clement (Despicable Me), Rodrigo Santoro (Che), will.i.am (Madagascar: Escape 2 Africa), Jamie Foxx (Dreamgirls), Jane Lynch "Glee"), & Wanda Sykes(Over The Hedge). I remember taking my daughter to see it opening night and we said we couldn't wait for this movie to come out on DVD--and now that time is (almost) here! Rio will be coming to Blu-ray and Dvd on August 2nd, but one lucky Babblings of a Mommy reader will get a chance to win your own copy right here! To enter to win simply answer this question: What kind of bird is Blu? "Like" Babblings of a Mommy on Facebook. Follow me on Twitter and tweet this: "I hope to win the Rio DVD #Giveaway from @babblingofmommy"
Remember each one counts as a different entry so be sure to enter them separately. You may tweet once a day if you'd like, but be sure to leave comment on post about your re-tweets. I do check and verify entries. Giveaway ends July 31st . A winner will be selected by random.org and will be notified via email. *A copy of Rio was provided for review purposes. UPDATE: Congratulations to dadacofe@gmail.com. You're the winner!! Thanks to everyone who entered. Be on the lookout for more giveaways soon! Blu is a Spix Macaw. He is a Spix Macaw! I liked babblings of a mommy on facebook. My fb name is talisha sturms. I am following using GFC. I subscribed to your feed using yahoo. Blu is a Spix Macaw! I am already a GFC follower! Spix Macaw. I already like you on FB, follow on Twitter, comment on your posts often, and dang it.... I fed you and looked-after you when you were younger, so I BETTER WIN THAT FREAGGIN' DVD!!! Hahaha! Twitter follower @HeidiHMc and tweeted! My email is thekoalafiles at gmail dot com! I follow on twitter and I tweeted! # "Like" Babblings of a Mommy on Facebook. Blu is a Spix Macaw. I am now subscribed to your site and a FB follower, too!